I used to think that for some reason pillowcases were complicated. Basic Pillowcases are actually quite simple and you can make a few in no time. I made the above two pillowcases in under an hour. 3. No batting or matching thread on hand?.. no problem since you don't need either!
. My guild did a sewing night recently and made a few pillowcases to be donated. 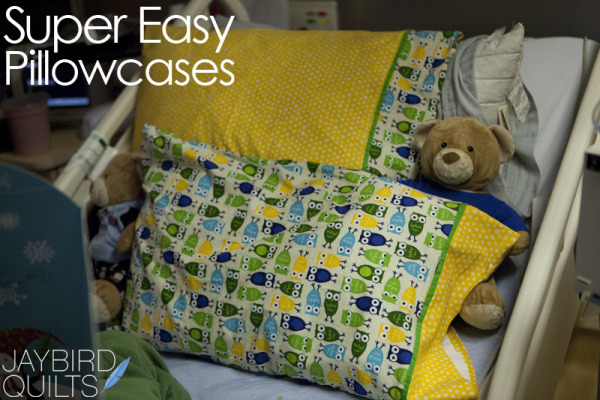 I decided to make a few new pillowcases for Elijah to brighten up his hospital room. In addition to making Elijah some new pillowcases I also made one for his neighbor in the hospital. I thought she could use a bit more color in her room as well & made her a bright one with purple and pink. My goal is to make a few more and hand deliver them to some of the other children at the hospital. For Elijah's new Super Easy Pillowcases I started with the Basic Pillowcase Pattern. I wanted to add a green flange to the pillowcases similar to the green flange on Elijah's Stash Stack Quilt. Below are directions on how to add a flange to the Basic Pillowcase Pattern. 1. Follow the Basic Pillowcase Pattern to cut the main four pieces. In addition cut two pieces 1.5" x 41" of the fabric you want to use for the flange. Fold the flange fabric in half along the long side and pin along one long side of the 10×41" pillowcase strip. Repeat for the second pillowcase. 2. Baste the flange in place with a large stitch and a scant 1/8" seam. 3. Follow steps #1 & #2 on pillowcase direction to join the ends and create band. At this point you can follow the rest of the directions to make the pillowcase. I chose to baste the two layers together as shown below before adding the cuff to the main part of the pillowcase. 4. Here are my finished pillowcase cuffs ready to be added to the main body of the pillowcase. Initially Elijah was too busy reading one of his giant cards to notice the new pillowcases. But he did discover that they made for a good foot rest. After a little while he cuddled up with them and went back to watching a movie. I'll be back on January 7th with A Little Birdie Told Me!